One of the most typical features of the countryside in the Netherlands, are the Dutch windmills. Whenever you are in Holland, you have to at least see some of them. Windmills have played a very important role in Dutch history. In a land of wind and water, the Dutch learned to live with the dangers these elements bring. But they also found out how to benefit from the wind, to manage the water. 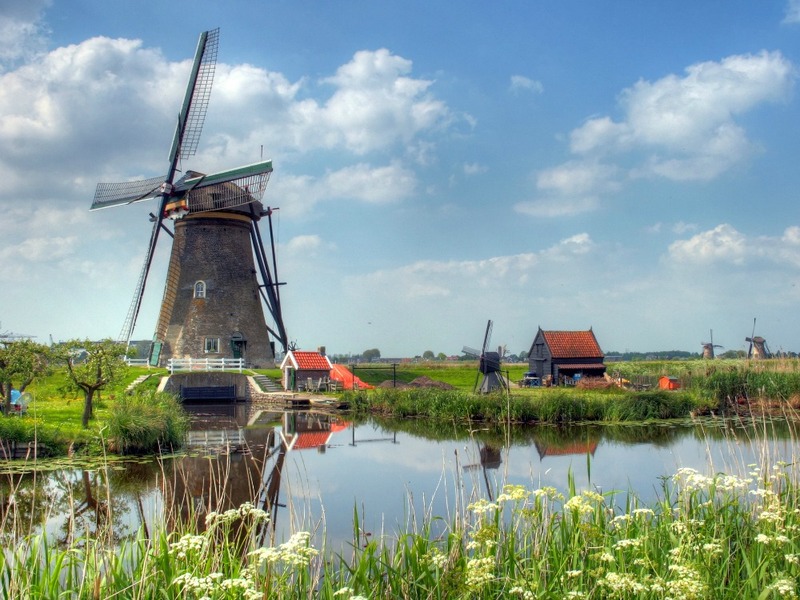 In the 17th century, The Netherlands counted over 10,000 Dutch windmills. They were used for watermanagement, but also had other uses. Today, modern wind turbines are used to power Google’s new European data center. But most people prefer to watch the traditional windmills, from which a lot are still present in the countryside around Amsterdam. In the early Middle Ages, life in The Netherlands was tough. The land mainly consisted of swamps, and was frequently flooded by the many rivers or the sea. Around the year 1400, people tried to manage the water a bit. Canals were dug to lead the water away, to the sea. And windmills were used to pump the water away from the swamps. While the swamps became dry, people found out that the soil consisted of peat (“turf”, or “veen” in Dutch). When dried, this substance could be used as fuel, to warm the houses in winter. Over the following centuries, the peat was dug away in many places, creating so-called polders. Windmills had to pump away more water, dikes were created, and locks for ships to travel on the old and new waterways. Nowadays, a lot of the Netherlands consists of polders, which are up to 7 meters below sea level. Most of the windmills are replaced by diesel and electric pumps. But a lot of the original Dutch windmills are kept operational by volunteers. Pumping water was actually not the first use of windmills. Much earlier, windmills were used to pound corn and grain, both in The Netherlands and the rest of Europe. Soon, as the Dutch needed to travel over water, an industry of boats evolved. Saw machines for timber to create these boats were powered by windmills. With the growing amount of Windmills created for water management, the Dutch became creative in finding other uses as well. 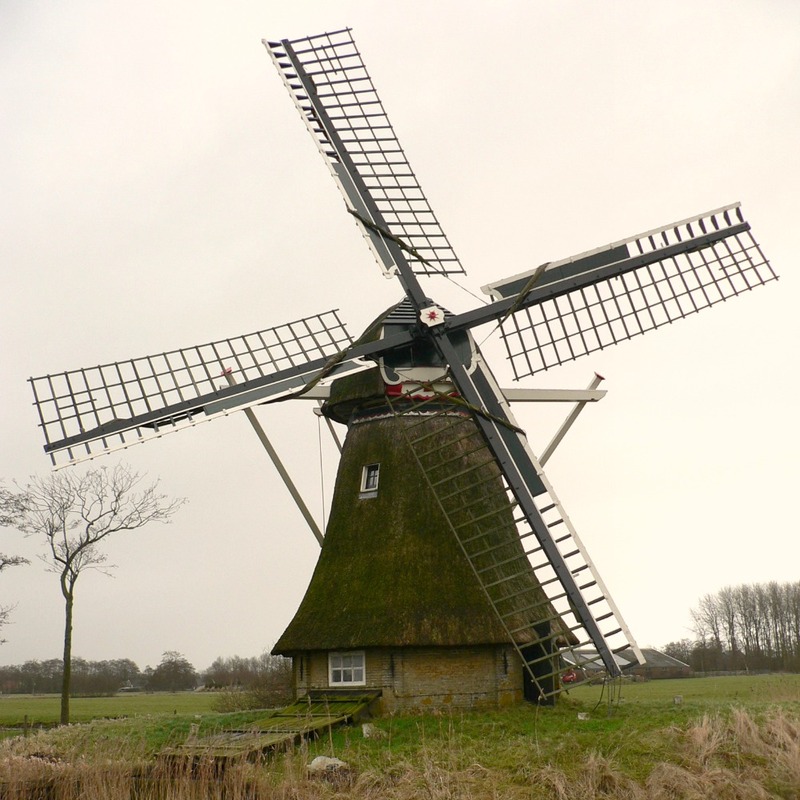 Industrial windmills were used to produce paper, oil, mustard, and the Dutch jenever drink (a strong liquor). Over the centuries, different types of Dutch windmills evolved, which you can still find in the Dutch countryside today. 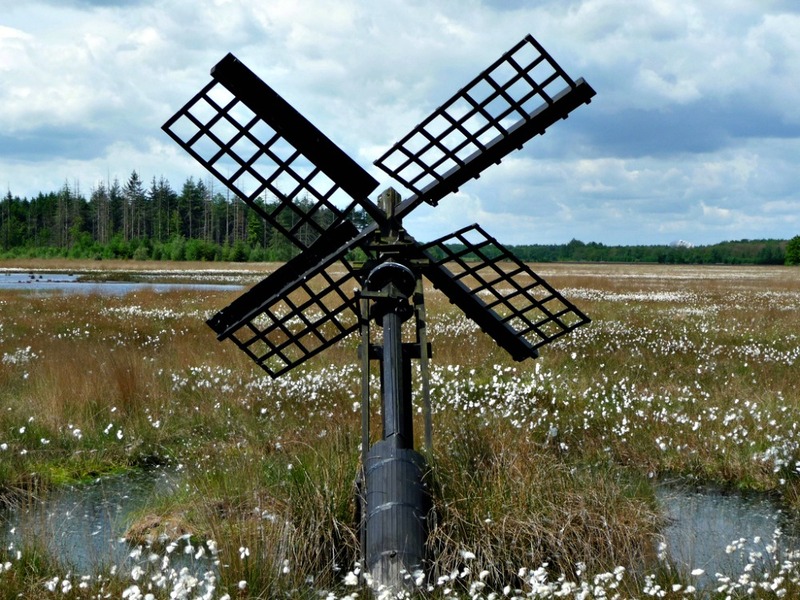 There are three general types of windmills: the Onderkruier (literally below porter), the Bovenkruier (top porter), and Middenkruier (middle porter). The Onderkruiers are simple, small windmills which need to be manually positioned into the wind. Of this type, the so-called Tjaskers have their sails on the same axis as the mortar to pump up the water. The standerdmolen (basic post mill) has a body built on a vertical pole. The body can rotate around the pole, and contains the gears to transform the movement of the horizontal axis to the pole. Middenkruiers are further developments of the basic post mill. In these, not the entire construction rotates around the pole. Examples of these general types are the small Weidemolen (meadow mill), the Spinnenkopmolen (Spider mill), and the Wipmolen (seesaw mill, also called Hollow post mill). Bovenkruiers are the most common Dutch windmills. 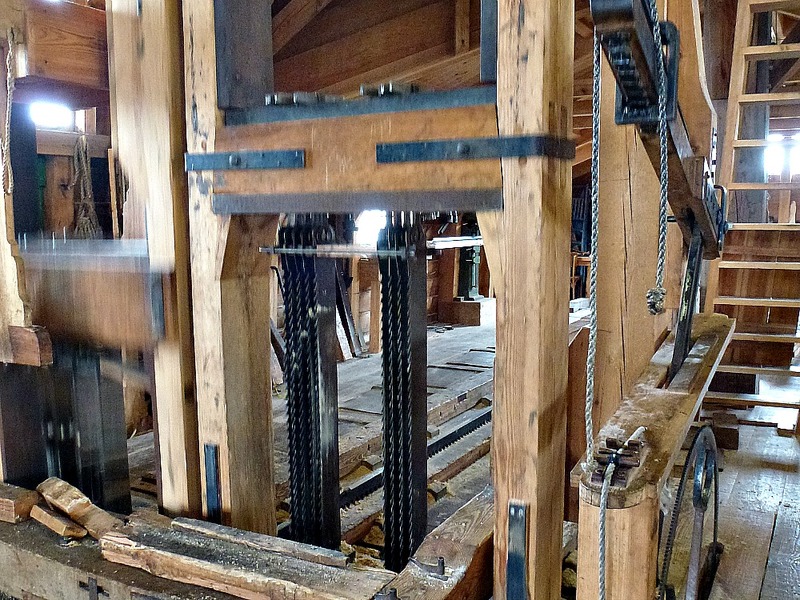 In these mills, only the top of the construction rotates into the wind. Of these, the Torenmolen (Tower mill, medieval mills created on a brick tower) and the Grondzeilers (Smock mill, with a wooden framework) are the most common. In a countryside with many windmills, the Dutch also used them for communication purposes. When not in use, the position of the windmill sails can signal special events to the citizens. During the second world war, the resistance used windmills to announce combined actions. And the arrival of Germans in a specific area could also be signalled. Nowadays, millers only use signalling to show joy (a birth, wedding, etcetera) or sadness (for funerals and disasters). 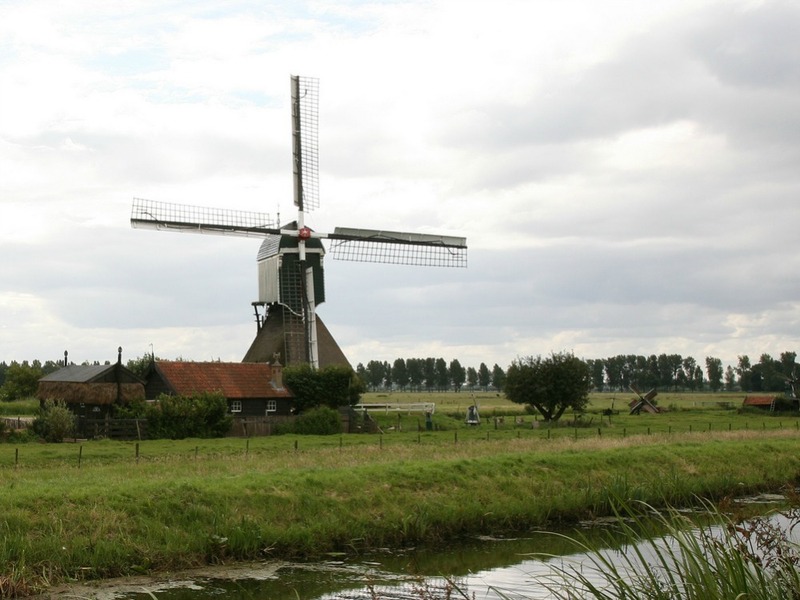 In the picture to the right, the bottom sail is just past the body of the mill (Note that most windmills always turn counter clockwise). This indicates mourning of the community. There are still around 1000 windmills throughout all provinces of the Netherlands. The province of South Holland is most densely populated with 228 of them. We just have the perfect tour for you. 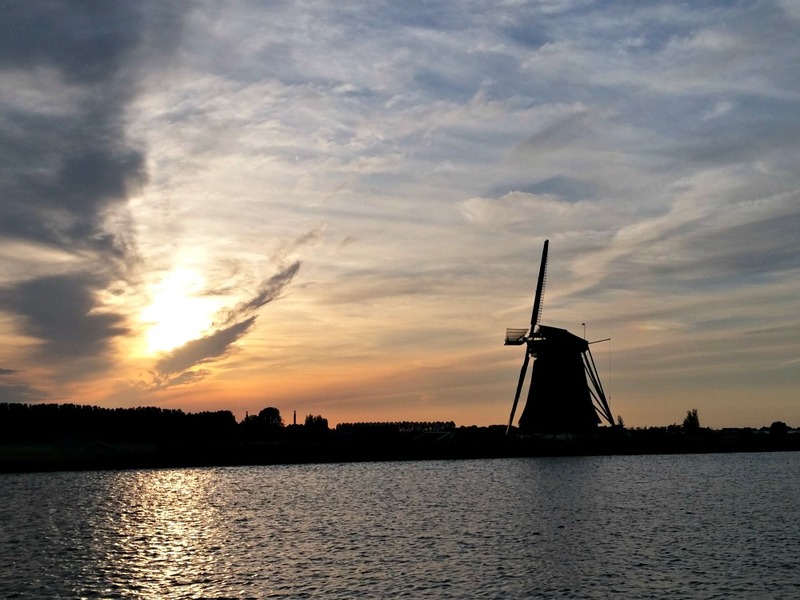 Within a half hour drive from Amsterdam we can take you on a walking, biking, or boat trip through the countryside along several Dutch windmills. Interested? Just contact us for more information.